This tempeh sandwich is one of my favorite vegetarian lunches. 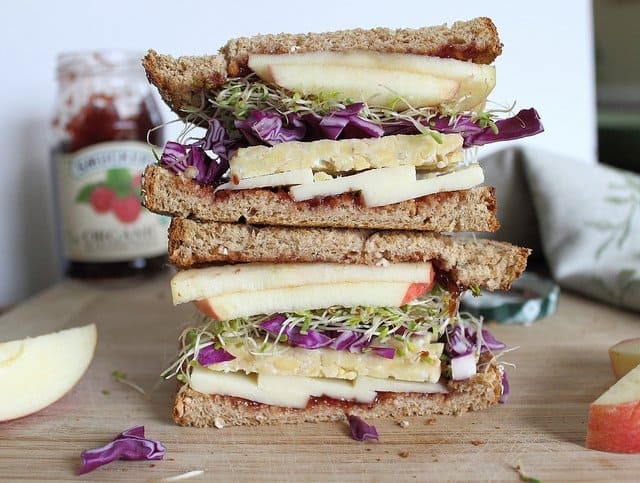 It’s piled high on whole wheat bread with cheddar, apples and jelly. I applied to 12 colleges in high school. They were all pretty much the same kind of school (relatively small liberal arts type places that cost a small fortune and could’ve single handedly kept J Crew in business with the amount of polo shirts worn by the guys alone). I got accepted into 11 of the 12 (I’m still bitter about that 1, thanks Georgetown) and had quite the decision to face when picking since it was pretty much like choosing which M&M is your favorite, they’re all different colors of the same damn thing. Two things made up my mind: lots of wine over Easter dinner in 2000 and the fact that Dickinson’s food was ranked 7th in the nation at the time. My parent’s would like to think it had something to do with the half merit scholarship and that I made a sound financial decision at the age of 18 but I really don’t deserve that kind of credit, it was the food. Dickinson’s caf was the first time I had ever even heard the term vegan let alone know what the heck tempeh was. If I had no idea how to pronounce it, it seemed best to avoid it altogether. True fact, I still look at the word and pronounce it “tem-pee” in my head even though I now know that’s wrong. It’s one of those words that I pause and take a second to think about before saying out loud to make sure I get right. I never actually ate it at college, it ended up taking about 6 years after graduation and a major healthy eating overhaul to get the courage to buy the nasty looking smooshed together pale substance for the first time. Buying it was the easy part, knowing what the heck to do with it was a whole ‘nother issue. I’ve experimented in many ways, some edible, some not even worthy of giving to the dog and it comes down to two meals that are my favorite. One weird as heck sandwich that somehow just works. Really, really well. 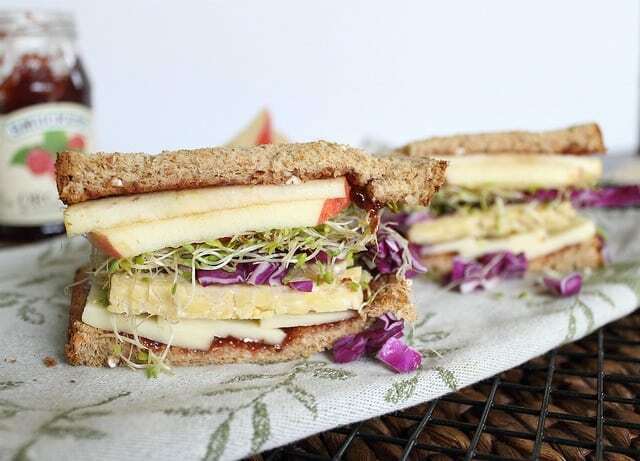 Raw tempeh, cheddar, jelly, apple slices and in this case sprouts and cabbage although, any greenery will do on toasted whole wheat. Don’t knock it till you try it. And I highly recommend you do. aw Gtown! yeah, they’re snooty, so don’t worry about it lol, but it would’ve been cool cause you would’ve gone to school in my neck of the woods! i can see why this sandwich, with the different variety of ingredients, you have in there would be good. i definitely won’t knock it because it really actually looks delicious. i like that you have jam and apples smushed together with the savory cheese. yum! :) Will be trying it this weekend! I like it as a vegan “BLT+A(vocado)”, just sliced really thin and grilled to be “bacon”. I was a vegetarian for 20-odd years and just had my first tempeh sandwich yesterday – a tempeh reuben, a la this place – http://www.thewildcow.com/twc/- minus the thousand island, extra spicy mayo. I’m sold. Tempeh sandwiches are so good! Sometimes it’s the simple things that are the best. I think I originally only applied to a handful of colleges straight out of high school, and of course didn’t get into the only one I cared about (damn you, Tufts!). So, I applied to another handful freshman year and ended up transferring to BC…also land of the polo shirts. haha, I remember visiting Tufts with my mom and getting to campus and just knowing I didn’t want to go there. I didn’t even want to get out of the car but considering it was a 3.5 hour drive, she made me. I love raw tempeh, and put it in wraps for lunch– I’m glad I’m not the only one!! The taste definitely grows on you! I’ve got a package sitting in my fridge that I’m trying to figure out what to do with. Perhaps this sandwich will do the trick! …though I am a bit nervous about the raw part. I applied to 13 and got into I think 11 as well. Although food wasn’t part of my decision it ended up being a good choice I have to say. My palette expanded exponentially on campus especially with the push for local and organic foods around me. Is tempeh good raw or do you steam it first? This is one of the only ways I like it raw. I do nothing to it but slice it and throw it on the sandwich. 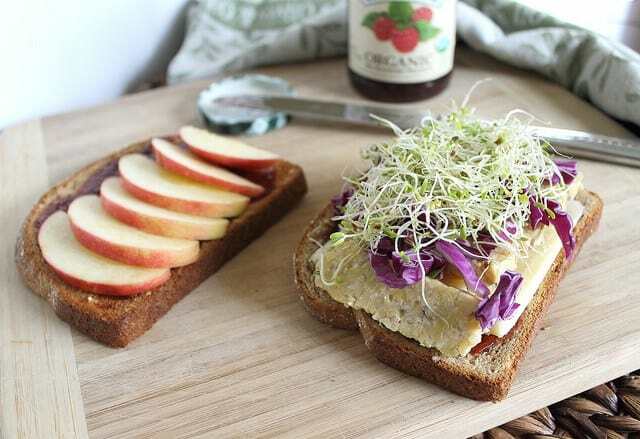 After posting my own raw tempeh with veggie recipe a few days ago, I am totally into it and your sammie looks gorgeous! Just read your comment on Jessica’s blog about traveling…eek. I didn’t realize you traveled THAT much. My hat is off to you! I went to Case and Columbia, BOTH are in major foodie cities. (cleveland and nyc)I ended up getting married senior year at Columbia and cooking all the time. I think I did things backwards. I’ve only tried Tempeh once and it was inedible, but I’m willing to try it again!! Oh dang! I so want this! What a delicious looking sandwich! This would be such an awesomely tasty way to jazz up my routine lunches. Thanks for sharing, Gina! Also, I’m having a great giveaway today with four potential prize winners, so you should enter! Don’t worry about bugging me! Ask away! Although, I’m honestly not the best person to ask NYC questions to b/c I never stay there, I just go home. But I’ll answer what I can! It looks delicious!! I’m pretty sure I pronounced it like Tempe, Arizona the first time I said it, too. I only applied to one college which all my other friends applied to and never thought to bother applying to others out there. Also, the foods I ate when I was in college were horrific. I don’t even know how I’m not morbidly obese right now living on burgers and fries. I have soaked tempeh in sauces before and fried them but never eaten them raw nor in a sandwich. Gotta try this because the combinations sound great! Very interesting combo!! I LOVE apple sliced on sandwiches. I went to UVA and would get smoked turkey, gouda, and apple on a croisant. Sweet and salty = perfection! Whata great sandwich! I love veggies andwiches and the addition is wonderful! I’m thinking I want this sandwich for lunch today!! I only applied to one, my heart was set on one and that’s the one that I went to. Bravo for 11 of your 12! That sandwich looks just weird enough to be delicious. That sandwich looks incredible!! I always love seeing what others put on sandwiches because I just feel like I get in a rut with mine (the rare time I have one!). Too many people are scared of raw tempeh, but I love it! Yum! I think I would love this, plus I can freak out my husband by eating it in front of him ;) He hates Tempeh but it’s one of my favorite things. I always slice a piece to eat raw before cooking it but I never knew you could just use it raw like this! That sandwich does sound a little weird but anything that pretty is bound to taste delicious! Woohoo Dickinsonians! :) I graduated in 2004 so I guess we were there at the same time for a bit. This looks amazing. I usually only do savory with my tempeh but the sweet apple idea has me drooling! As a proud Hoya, I couldn’t help but smile when I saw mention of Georgetown. Even if you didn’t get in, 11/12 schools is very impressive and it sounds like Dickinson’s dining hall is much more impressive than Georgetown. I was in search of a tempeh recipe and found your blog through foodgawker. This sandwich looks awesome and I will have to give it a try. ps. I am currently a senior at Dickinson! We now (as of a few years ago) have a special counter in the caf called the KOVE which stands for Kosher Vegan dining and the produce some tasty meals.